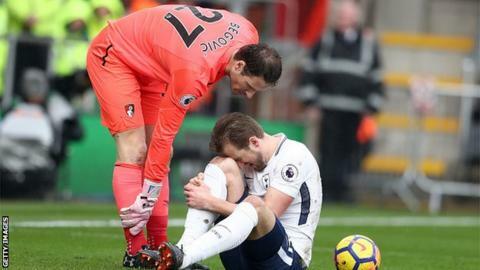 Tottenham and England striker Harry Kane will be out until next month after damaging ankle ligaments in Sunday's Premier League win over Bournemouth. Spurs said in a statement that "preliminary assessments" confirmed the injury after a scan on Monday. Kane, who has scored 35 goals for Spurs this season, injured his right ankle in a collision with Bournemouth goalkeeper Asmir Begovic. The 24-year-old should be fit for England's World Cup campaign. But he will miss Spurs' FA Cup quarter-final at Swansea on Saturday, as well as two England friendlies the following week. Gareth Southgate's men travel to the Netherlands on 23 March before hosting Italy on 27 March. England's first World Cup match is on 18 June against Tunisia. Kane missed 10 games last season with a similar injury to the same ankle in a game at Sunderland in September 2016. He injured the same ankle again in Tottenham's FA Cup quarter-final victory over Millwall in March 2017. On that occasion he was out for four weeks. "Disappointing to be out until next month but injuries are part of the game," he wrote on Twitter. "Will do everything I can to get back out there ASAP."